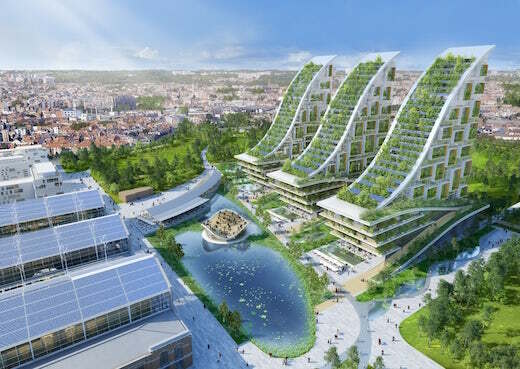 Architect Vincent Callebaut is well-known for his ambitious sustainable architecture project proposals, and this latest one that he’s proposing for the EU city of Brussels is no exception. His plans call for turning the city’s industrial area of Brussels into a sustainable community. 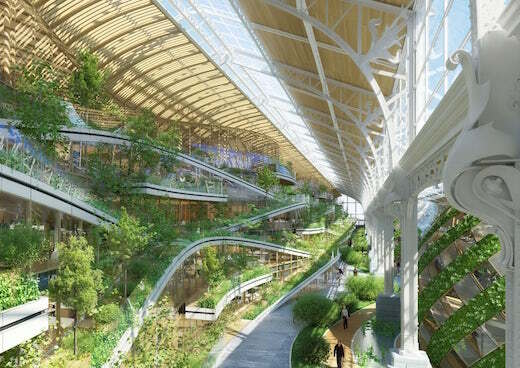 They plan to renovate existing buildings, as well as build new high-rises, which would be equipped with a wide array of sustainable features. Callebaut’s plans call for the building of three high-rises, which would have a total floorspace of 915,000 sq ft (85,000 sq m). These buildings would feature a slide-like shape and rise to a max height of 328 ft (100 m). The roof would be clad in solar panels, while the balconies could be used to grow fruits and vegetables. The plans also include the renovation of the old Marine Terminal, which measures 538,000 sq ft (50,000 sq m) to serve the communities needs. It would be divided up into different areas, and would feature several geodesic domes that would house restaurants, bars and other structures. There would also be raised pods made from CLTs that would serve as meeting spaces. Retail and office spaces would be housed in another set of CLT structures. 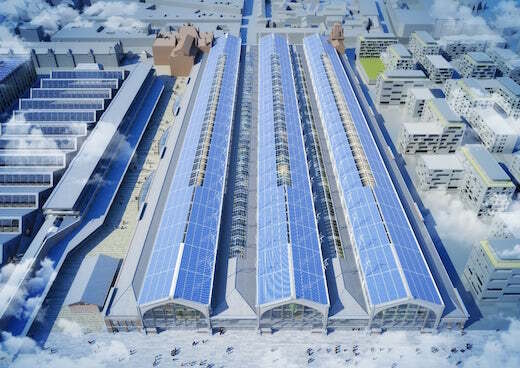 It would also be possible to attach small greenhouses to the exterior of the buildings. 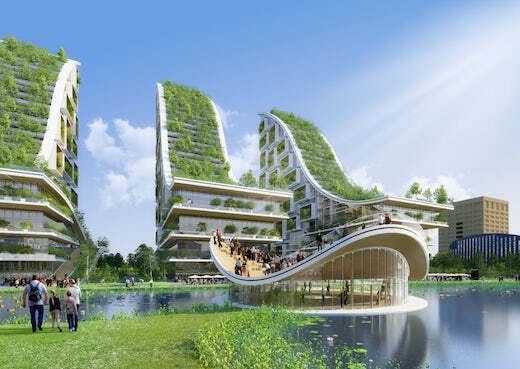 Among the green tech planned for this project are the already mentioned large solar power arrays, wind turbines, airtight building envelopes, natural ventilation, and rainwater collection systems. They calculated that the complex would generate 186 percent of its annual electricity requirements, and this surplus would then me used to power the historic buildings in the area, as well as any planned future developments. We will, however have to wait and see whether this project gets picked up by the city’s planning commission. Wind energy is one of the cleanest, most abundant, sustainable and cost-effective ways to generate electricity. It’s also one of the fastest growing U.S. electricity sources. At the end of 2013, there were enough wind turbines across the country to power 15.5 million typical American homes and cut annual power sector carbon emissions by 4.4 percent. That amounts to 96 million metric tons, the equivalent of taking 20.2 million cars off the road. Regardless, wind has its detractors, and one of their biggest complaints is the threat they say it poses to birds. In fact, compared with other culprits, wind turbines are way down in the pecking order. The top human-built environmental threat to our feathered friends—besides habitat degradation and destruction—are buildings. As many as 970 million birds crash into them annually, according to a June 2013 study in the Wilson Journal of Ornithology. Other studies estimate that every year as many as 175 million birds die by flying into power lines, 72 million are poisoned by misapplied pesticides, 6.6 million perish by hitting communications towers; and as many as a million birds die in oil and gas industry fluid waste pits. Conversely, a study published late last year in Biological Conservation estimates that land-based U.S. wind turbines kill 140,000 to 328,000 birds annually. That’s not insignificant, but certainly not the scourge that wind foes contend. 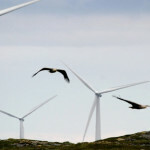 What about wind energy’s threat to eagles? A study in the September 2013 issue of the Journal of Raptor Research found that wind turbines in 10 states killed 85 eagles between 1997 and the end of June 2012—79 golden and six bald. That’s fewer than six a year on average, but most of the deaths occurred between 2008 and 2012 due to industry growth, and the study’s authors were quick to point out that the number of turbine-related eagle deaths is likely much higher. The study didn’t include wind industry-related eagle deaths in three other states as well at the 1980s-era Altamont Pass in Northern California, which has been killing an average of 67 eagles a year. For discussion’s sake, let’s add the 67 eagle deaths a year at Altamont Pass to the 85 the study confirmed, which amounts to 1,124 dead eagles over a 15-and-a-half-year period. How does that compare with overall non-natural eagle deaths? When an eagle is killed and people find a carcass, the U.S. Fish and Wildlife Service (FWS) asks them to send it to the National Wildlife Property Repository near Denver, CO. About 2,500 show up every year, according to FWS, although certainly more go unreported. Using that number as a benchmark, the number of dead eagles annually from 1997 through June 2012 would amount to approximately 38,750 birds. Based on these admittedly crude estimates, only three percent of the eagle deaths were attributable to commercial, land-based wind turbines. Poachers, transmission lines, pesticides and lead poisoning from bullet-ridden carrion killed significantly more. Wind opponents also allege that the Obama Administration is playing favorites, treating the wind industry with kid gloves when it comes to bird deaths while aggressively prosecuting the oil and gas industry for similar infractions. Until last November, however, no administration had ever prosecuted a wind company under the two main federal bird protection laws, the Migratory Bird Treaty Act (MBTA) and the Bald and Golden Eagle Protection Act. That’s when the Justice Department reached a settlement with Duke Energy, which pleaded guilty to killing 14 eagles and 149 other birds at two Wyoming wind farms. And more prosecutions may be in the wings. FWS is currently investigating 17 wind industry-related bird death cases and has referred six of them to the Justice Department. According to FWS, prosecution under the two laws is always the last resort, regardless of the industry or technology in question. The agency tries to work with violators to fix the problem before it refers a case to federal prosecutors. For example, FWS inspectors routinely check for bird carcasses in oil and gas company waste pits. When they discover dead birds, they notify the responsible company and give it the opportunity to rectify the problem by installing netting. If the company pays a modest fine and corrects the problem, FWS will not file a case. That happens only after repeated violations, and even if a company is ultimately convicted and placed on probation, the fine is relatively small. In 2011, FWS filed criminal charges against three companies drilling in North Dakota’s Bakken shale formation. One of those companies, Continental Resources, was indicted for killing a single bird in one of its waste pits. Wind opponents routinely cite this case when alleging the Obama Administration is treating the oil and gas industry unfairly. But they don’t mention that Continental Resources and the two other companies had been killing birds for years. The Justice Department charged them with violations based on the number of dead birds FWS agents found when they made their last site visit following years of imploring the companies to install nets. Wind opponents also don’t mention that a district court dismissed the charges, issuing a ruling that squarely conflicts with how the government has traditionally interpreted the MBTA. Wind critics likewise overlook the fact that the federal government and the wind industry have taken steps to mitigate the threat turbines pose to birds. In 2008, a number of leading wind developers joined with conservation and science groups, including the Union of Concerned Scientists, to launch the American Wind Wildlife Institute to promote wind development and protect wildlife at the same time. Four years later, FWS issued new voluntary guidelines covering siting, construction and other key issues for wind developers to minimize harm to birds and their habitats. Meanwhile, a number of remediation efforts are underway. As part of a settlement with the California state government and environmental groups, for example, the largest wind power company in the Altamont Pass is replacing thousands of outdated turbines with a lot fewer, taller, more-efficient ones that pose less of a threat to the golden eagles, hawks and other birds that patrol the skies in the area. So far those efforts and other modifications appear to be producing results. Finally, there’s one last critical point wind opponents conveniently ignore: climate change threatens hundreds of migratory bird species, which are already stressed by habitat loss, invasive species and other environmental threats. A 2012 report by the National Wildlife Federation went so far as to name climate change the most serious threat facing America’s migratory birds today. So if wind opponents were really concerned about the welfare of birds, they would be calling for more wind farms and other carbon-free energy sources to replace coal, oil and natural gas. In other words, their argument against wind is strictly for the birds. 1. Solar Arrays – The solar panel kit offered by HarborFreight.com produces 45 watts of power while providing the capabilities to power small 12-volt devices. It also supports the use of 5 volt USB devices such as phone charges and other USB electronics normally purchased for computers. This kit can be expanded on by combing more panels together while using a deep cycle battery and an inverter – both are sold separately. This is a fun and quick project for your children to assemble and can be utilized in many ways for practicality such as camping or tied into your home power needs. The kit itself is less than $250. 2. Wind Turbines – For less than $130, you could demonstrate to your children the power of wind turbines from KidWind.com. These wind turbines can be purchased as small single units to elaborate classroom kits, each turbine producing as much as two watts of power. These kits are tailored specifically for children and include easy to follow instructions in order to assemble them. Although they may not have the maximum production value of power as the solar kit listed above, they can easily be used to demonstrate how humans can harness natural sources of energy without consuming fuels to do so. 3. Small Solar Panels – For those who don’t want to spend a great deal of money teaching their children about solar power, LegacyStation.com offers an inexpensive kit to power several different projects. This 6-in-1 kit is under $20 and can demonstrate how to use solar power in order to create vehicles or propulsion systems in aircraft. These are easy to assemble and will provide a great deal of entertainment without the use of a single battery. Of course, there is nothing wrong with modification of any project should you want to demonstrate how solar arrays can power an object while charging a battery in order for the object to continue functionality when solar power is low. This would only require the use of a battery pack and rechargeable batteries that can be picked up from Radio Shack for less than $20. 4. Pressurized Power – While solar and wind are two of the most popular and practical methods for renewable energy sources, NationalGeographic.com has made an air and water power kit to teach children about how pressure can be used to power a variety of machines including vehicles. The kit allows children to build 15 different vehicles all powered by hydro-pneumo technologies. Pressurized air and water can be used as a form of propulsion, and the kit costs less than $50. The U.S. Department of Energy talks about significant investments it has made in wind turbine testing capabilities. Thank you for your interest in this story. To read the rest of it, please visit EarthTechling.